Doing research does not merely involve searching out sources that support and affirm an already-formed argument, but allowing the information at hand to shape the argument; this approach to research is an enactment of the rhetorical virtue of honesty. What sources or information does Stellon look at to shape his claims? Does he consider other opinions, or counterarguments, in order to best enact honesty? Research essays best capture the attention of readers when there is something at stake. How does Stellon use his introduction and conclusion paragraphs to establish the immediacy and importance of his topic, through the use of elements such as startling comparisons and call to action? Including transitions between paragraphs is akin to building a bridge so that the reader can easily cross from one idea to the next. What are some methods Stellon uses in his transitions to efficiently guide the reader through his logical flow from paragraph to paragraph? Imagine a place where information is distorted by a controlling body. Imagining this can lead one to create many different images all leading to overall similar outcomes. Some may envision a real-world example like China where multiple media outlets are restricted from the public. Others might picture a dystopian society like the one depicted in George Orwell's novel 1984 in which the government intentionally rewrites history. Very few would paint the image of the modern day United States of America in reaction to this prompt, but in reality, this image is not an incorrect one. According to Ben Bagdikian, journalist and author of The Media Monopoly, in 1983, fifty corporations controlled the majority of information presented by the media but only 21 years later, in 2004, that number was reduced to only five corporations dominating the same percentage of media information. This rapid increase in media conglomeration in the United States is in part due to the decrease in FCC (Federal Communications Commission) regulations. Within the last year, FCC regulations have begun changing again, allowing these conglomerates, especially those in local news, to become even more present in American society, limiting the number of perspectives on important topics and threatening the integrity of democratic journalism along with the overall presentation of information, or the lack thereof. The issue of media ownership dates back to the First Amendment, which was created to protect the freedom of press from government restriction of information. Issues arose when radio communications became prevalent in the 1920s, which restricted the number of media outlets that could provide information due to a finite number of radio lengths upon which people could broadcast. To monitor who was broadcasting, the FCC was created in 1934 to license the radio spectrum to media outlets. The FCC chose which corporations could broadcast based on criteria consisting of the outlet's necessity, convenience, and overall ability to serve the public interest. As new forms of media were created, the FCC refined its regulations regarding the ownership of media outlets, primarily restricting the number of outlets a single entity could own. These regulations were put in place to prevent a person or company from monopolizing the market for information presentation as that would limit the number of perspectives on important topics. Over time however, FCC regulations have become more relaxed, allowing large companies to own significant portions of many types of media. Very recently, the FCC has become extremely active in changing regulations as President Trump has appointed new chairman Ajit Pai. Mr. Pai has worked for the FCC since 2012; originally appointed to a position on the committee by President Obama, now, under new presidential leadership, he has taken over as the head of the FCC. Throughout his career Pai has shown his support for deregulation in favor of large communication businesses. In particular, Pai has a deep connection to the Sinclair Broadcasting Group— it is known that Pai met with Sinclair executives multiple times to discuss FCC policy prior to being appointed chairman. In his short time as chairman, he has already shown support for this firm through his deregulatory actions. Sinclair Broadcast Group, Inc. is one of the largest and most diversified television broadcasting companies in the country. Sinclair owns and operates, programs or provides sales services to more television stations than anyone and has affiliations with all the major networks. In addition, Sinclair is the leading local news provider in the country, as well as a producer of sports content. Sinclair owns a multicast network, four radio stations and a cable network. Sinclair's broadcast content is delivered via multiple-platforms, including over-the-air, multi-channel video program distributors, and digital platforms. Simply put, Sinclair is a news broadcasting company that delivers its programs through the ownership of smaller local stations. 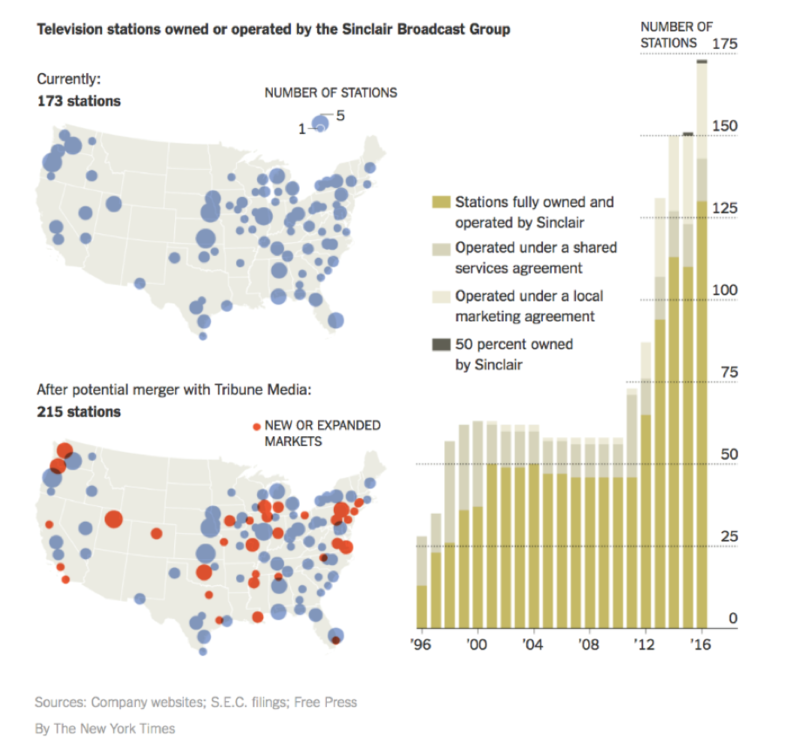 Currently, Sinclair owns 173 television stations across the United States. Owning and controlling this many local stations practically makes Sinclair one of the TV news giants to be compared with the likes of national programs such as Fox News or CNN. To broaden its reach, Sinclair is attempting to buy Tribune Media, another owner of local news stations, for $3.9 billion. The deal is currently under review by the FCC; if the deal goes through Sinclair would add another 42 local stations to its system and, according to the FCC, it would reach 72% of American households and would own and operate the largest number of television stations of any group, which means Sinclair would further dominate the local news market. Sinclair not only controls the local news market, it also heavily controls the content of its stations. Sinclair allows its television stations to run traditional local news programming, but in addition, the company requires its channels to feature segments called "must-runs" and has control of the advertisements that appear during the programming. Taking a look at Sinclair's programming, a viewer would see segments like "The Terrorism Watch Desk," one of Sinclair's common must-run pieces, that gives viewers a daily update on terrorism worldwide. This in itself is absurd because it forces news stations to find material to fill the daily segment even though terrorism is not a daily event in any sense. This has led stations to run segments on unrelated Muslim events like a law banning traditional Muslim attire on French beaches which leads viewers to believe that any event regarding Muslims is now a terrorism event. Another "must-run" segment is a monologue titled "Bottom Line with Boris" by Sinclair's recently hired Chief Political Analyst, Boris Epshteyn, who worked for the Trump campaign during the most recent presidential election. Common advertisements shown on Sinclair networks are Republican political ads, and during the last election cycle there was a large number of Trump ads shown on the networks. Regardless of their blatantly biased programming, Sinclair continues to claim it is an unbiased media outlet that boasts impartiality, writing in a memo, "We are proud to offer a range of perspectives, both conservative and liberal — to our consumers — on our Sinclair broadcast stations each day. It is unfortunate that so many of our competitors do not provide the same marketplace of ideas." Nevertheless, it is clear that the company holds a strong conservative bias comparable to national cable news outlet Fox News because of Sinclair's politically slanted mandated programming and advertisements. This bias and nation-wide reach most likely mean nothing to many readers because Americans are accustomed to heavily biased national news programs, but Sinclair's political bias is made much more influential because of the anonymity of the group. In 2016, a study from the Pew Research Center found that 80% of Americans trust the information from their local news program, but their trust falls to 60% when asked if they trust national news organizations. This increased trust of local news can be attributed to viewers' perceptions that local news is more relevant and is delivered by a familiar news team which makes viewers believe that their values are represented. According to another study sponsored by Videa, the most important reason people trusted their local news over national programming was because they felt that it lacked bias and didn't have a political agenda. Citizens' trust in local news is the factor that makes Sinclair immensely dangerous because it gives Sinclair the power to deliver biased content through the façade of a trustworthy local station. Moreover, while watching local news, viewers virtually have no way of knowing their station is owned by Sinclair. This is because even though the station is owned by the Sinclair, it goes by the name of the local station that is familiar to viewers. This anonymity grants Sinclair the trust associated with a local news station and the wide reach and mass programing of a cable network. Combined, these factors give Sinclair large power over the information its viewers receive without them even realizing it. Sinclair's unreasonable power over local news programing is critically important to United States media. Since Sinclair is such a large and growing business, its political ideology prevents important stories from being told. For example, in 2004, two weeks before the presidential election, Sinclair forced its television stations to air a documentary criticizing Democratic candidate John Kerry's activism during the Vietnam War. Later that year, Sinclair blocked a broadcast of a "Nightline" episode showing soldiers killed during the Iraq war. In response to backlash about blocking the segment Sinclair published a letter saying, "'Nightline' is not reporting news; it is doing nothing more than making a political statement." Here, Sinclair is saying that the segment was not run because it is no better than a political advertisement, but the segment is an important news story because it shows viewers the reality of war. Although it is within Sinclair's right as the owner of the station to decide which programs are aired, it is unfair and misleading to viewers to run politically biased news features under the curtain of a trustworthy local news station while blocking other programs that conflict with Sinclair's political goals. Because of its political ideology, Sinclair is damaging the reputation of American media by favoring segments that support its beliefs and omitting those highlighting opposing viewpoints. Because of the political slant of large media companies such as Sinclair, the FCC needs to further regulate media conglomerates because a decrease in the number of companies owning media outlets decreases the variety of perspectives portrayed to viewers. As previously mentioned, there has been a growing shift in the last 30 years towards a decreasing number of entities that dominate American media caused by FCC deregulations. One blatantly obvious effect of this is a shrinking number of perspectives on important issues. The beauty of democracy lies in the belief that all people have a say in government, but with fewer conglomerates dominating the media fewer viewpoints are being shared across the United States. Media conglomerates like Sinclair are being approved by the FCC and are beginning to create a homogeneous point of view in the United States. As Ben Bagdikian puts it, "The American audience, having been exposed to a narrowing range of ideas over the decades, often assumes that what they see and hear in the major media is all there is. It is no way to maintain a lively marketplace of ideas, which is to say it is no way to maintain a democracy." Like Bagdikian states, FCC approved media conglomerates are constricting the range of perspectives by only displaying a small portion of the viewpoints that actually exist. Because of this, the political spectrum is shrinking and insights on other important issues are not displayed in a way that accurately reflects the diverse thinking in the United States. Building off the fact that monopolistic media corporations are limiting the democracy of news is the fact that large media companies are killing off real investigative journalists. These journalists are critically important to American society and historically have been since newspapers became a widespread form of communication. The function of these journalists is to expose corruption and wrongdoing through in-depth research used to gather hard evidence. Doing this labor-intensive job is no easy task as producing a story up to the standards of investigative journalism takes significant amounts of time and resources. As such, this type of journalism is not a very lucrative business. When added to the fact that some of these journalists work for smaller local news companies, it is clear that investigative journalism cannot compete with the giant media conglomerates. Some would argue that investigative journalists are still being hired by large media companies, but even though media conglomerates have their own journalists, these journalists are not doing viewers a service because the journalists only cover stories favorable to the parent company. Due to FCC deregulation allowing large media empires to flourish, there is no place for individual journalists, especially those in small markets, to thrive. Because of this, American society is losing the watchdogs that ensure fairness through their exposure of corruption. In all, when the FCC allows large media companies to form, small investigative journalists are killed off just like any other small business in the face of an omnipotent monopoly. As depicted in the graphic, Sinclair's reach across the United States has already been expanding over the last 20 years, and if the FCC allows the Sinclair/Tribune acquisition to occur then Sinclair will further expand upon its local news empire. It is the duty of the FCC to maintain the democratic aspect of the media; recent and planned deregulations are allowing media monopolies to dominate American news. Even though the evidence for maintaining strict FCC regulations may seem overwhelming, there still is an argument to be made for allowing large media business to flourish. People like Ajit Pai, owners of media conglomerates, and other like-minded individuals have their reasons for deregulating the FCC. The first and most common argument they make is that the current FCC regulations are outdated and can't apply to today's society with increased technology and media platforms. Mr. Pai himself states, "The marketplace today is nothing like it was in 1975," which is correct in the sense that it is important that laws are mended with changes in the times to meet societal demands. Pai's argument is built on the idea that television and cable media outlets cannot financially compete with modern outlets like Google, Facebook, and Netflix because these new outlets are taking audiences that were at one point only served by television. This argument fails because it assumes these audiences will no longer receive news information from television when in reality 2016 data from the Pew Research Center shows that the majority of Americans still get their news from television. Using this data, it is clear that FCC regulations do not need to be drastically changed to increase television viewership as it is still the leading source for news. Building off the argument that television news needs less regulation to compete with online media is another common argument that deregulations would lead to increased reinvestment in news companies, benefiting the public. Sinclair and other large media conglomerates state that increased deregulation would allow the companies to invest in new and better equipment and technology. Better equipment and technology is undoubtedly a positive for media consumers, but this argument is overall much too simplistic to hit home. FCC regulations are in no way stopping companies from improving their equipment. The regulations are put in place to stop companies from owning unfair portions of media. In reality, less media regulation, as is seen through past trends, leads to fewer companies dominating media. Fewer companies clearly means less competition. Competition is the driving force of innovation in a market economy, thus limiting competition would surely slow down improvement and increase prices for services. Through this lens, it is obvious that media conglomerates actually desire less competition because they can charge more for their product and spend less money on creating the best product, rather than because the companies want to update their equipment as the conglomerates would argue. The United States of America is reaching a critical point in the management and oversight of the media under the Federal Communications Commission. There is a clear trend towards deregulation of media which has caused powerful media conglomerates to form, dominating American information presentation. Under Ajit Pai's new leadership of the FCC, local news has started seeing a rampant increase in the consolidation of local stations by companies such as the Sinclair Broadcasting Group. If the trend towards consolidation continues American media will struggle to provide a diversity of perspectives and the important information that can only be provided by independent news organizations. The pressing dangers of a deregulated and consolidated media, now made clear, are in the drastically decreasing variety of news in the United States. Although this consolidation has already begun, it is not too late to reinstate FCC policy that regulates media and protects United States media; citizens can vote for politicians who actively support necessary media regulation, contact current representatives, and become educated on the corporations that dominate the American news market. If these measures are taken, diverse perspectives will once again flourish in the media and the integrity of democratic journalism will be preserved. Jacob Stellon is a class of 2021 student majoring in Chemical Engineering at the University of Notre Dame. He is from Saint Charles, Illinois and is a proud member of Carroll Hall. Jacob is passionate about implementing the wide spread use of renewable energy and resource conservation. Upon graduation, he hopes to use his Notre Dame education to continue developing these passions. This essay, titled The Death of Local News, investigates the FCC's deregulation of media allowing companies like the Sinclair Broadcasting Group to monopolize the American news industry. The inspiration for this essay came from a Last Week Tonight with John Oliver segment featuring the absurdities of Sinclair that Jacob found particularly interesting. Jacob recognizes Sarah Snider, his Multimedia Writing and Rhetoric professor, for her outstanding help through the revision process of this essay and for an incredible first year writing course. "Americans Trust Local News Media Over National Outlets." Videa, 26 Oct. 2017, www.videa.tv/2017/06/americans-trust-local-news-media-over-national-outlets/. Cecilia Kang, Eric Lipton And Sydney Ember. "How a Conservative TV Giant Is Ridding Itself of Regulation." The New York Times, The New York Times, 14 Aug. 2017, www.nytimes.com/2017/08/14/us/politics/how-a-conservative-tv-giant-is-ridding-itself-of-regulation.html. Greenwood, Shannon. "Trust in the News Media." Pew Research Center's Journalism Project, 9 May 2017, www.journalism.org/2017/05/10/americans-attitudes-about-the-news-media-deeply-divided-along-partisan-lines/pj_2017-05-10_media-attitudes_a-05/. Heffter, Emily. "Sinclair Known for Conservative Political Tilt." The Seattle Times, The Seattle Times Company, 12 Apr. 2013, www.seattletimes.com/business/sinclair-known-for-conservative-political-tilt/. Kang, Cecilia. "F.C.C. to Loosen Rules on Local Media Ownership." The New York Times, The New York Times, 25 Oct. 2017, www.nytimes.com/2017/10/25/technology/fcc-media-ownership-rules.html. McFadden, Robert D. "Ben H. Bagdikian, Reporter of Broad Range and Conscience, Dies at 96." The New York Times, The New York Times, 11 Mar. 2016, www.nytimes.com/2016/03/12/business/media/ben-h-bagdikian-reporter-of-broad-range-and-conscience-dies-at-96.html. Michael J. De La Merced And Cecilia Kang. "TV Station Owners Rush to Seize on Relaxed F.C.C. Rules." The New York Times, The New York Times, 1 May 2017, www.nytimes.com/2017/05/01/business/dealbook/tv-station-owners-rush-to-seize-on-relaxed-fcc-rules.html. Mitchell, Amy, et al. "1. Pathways to News." Pew Research Center's Journalism Project, 7 July 2016, www.journalism.org/2016/07/07/pathways-to-news/. "Sinclair and Tribune, MB Docket 17-179." Federal Communications Commission, 6 Nov. 2017, www.fcc.gov/transaction/sinclair-tribune. Tempera, Jacqueline. "WJAR Forced to Run pro-Trump Programs." Providencejournal.com, Providencejournal.com, 22 Sept. 2017, www.providencejournal.com/news/20170916/wjar-forced-to-run-pro-trump-programs. "Welcome to SINCLAIR BROADCAST GROUP." | The Largest and Most Diversified Television Broadcasting Company in the Country Today, sbgi.net/.